Cloverleaf Cottage Court, located on Brooktrout Drive in the City of Victor, Idaho, included the subdividing and development of the property into six small single family lots, each with a Net Zero Ready home designed by the client, Love ǀ Schack Architecture. Harmony Design & Engineering completed the site civil engineering for this project. Harmony coordinated with the client and the City of Victor staff to provide construction drawings and improvement plans as required for a sanitary sewer, water services (meters and taps to public main), a grading and drainage plan and report, site details, cost estimate, and construction phase services. All infrastructure was designed to meet the City of Victor requirements. Harmony prepared a Letter of Map Amendment (LOMA) application and supporting material to remove a portion of the property that lies outside of the floodplain. Harmony provided Construction Phase services that encompassed preparing a Stormwater Pollution Prevention Plan (SWPPP) in accordance with EPA requirements for construction sites greater than one acre, construction observation and documentation as required by the City of Victor, organizing a pre-construction meeting with City staff and contractor, reviewing RFI’s and submittals, preparing record drawings and approval checklists for submittal to the City. The West Little Avenue improvement project was designed using the latest standards and best practices set forth by the National Association of City Transportation Officials (NACTO), the American Association of State Highway and Transportation Officials (AASHTO), and the Manual of Uniform Traffic Control Devices (MUTCD). A public open house was held in a highly visible storefront in order to gather feedback on design elements such as sidewalks, bike lanes, landscaping, pedestrian amenities, parking, and civic space. Harmony worked with the City of Driggs to revise the concept plans until Option F was used to guide construction. In the end, an attractive and inviting environment for tourists and residents with a focus on pedestrian and bicycle safety was constructed using final engineering drawings completed by Harmony. These included demolition plans, grading plans, drainage plans, roadway plans, utility plans, landscaping plans, and signage and striping plans. Creative stormwater drainage solutions for the street included the use of bioinfiltration swales between parking areas and sidewalks. The project was funded by Idaho Transportation Department grants and was completed in early winter 2015. The project was awarded a 2017 Idaho Smart Growth Grow Smart Award in November 2017​. 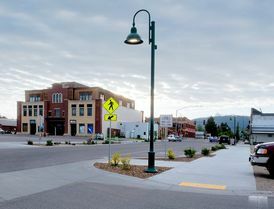 The Driggs Missing Links Pathway Connection Projects A, B, and C consisted of three separate pathway and sidewalk connections that completed a continuous multimodal pedestrian and bicycle connection through Downtown Driggs from the Creekside Meadows Subdivision north to the Driggs Airport. This pathway system consisted of a combination of 8-ft wide concrete sidewalks and 10-ft wide separated asphalt pathways, and involved numerous at-grade crossings of busy collector roads and business accesses and one at-grade crossing of Idaho SH-33. 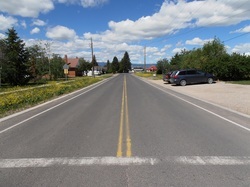 The at-grade crossing of Idaho SH-33, the busiest section of road in Teton County, Idaho, required coordination with the Idaho Transportation Department. Additionally, the project required the resolution of multiple utility crossings and the design and specification of a concrete box culvert at an irrigation canal crossing. Harmony provided preliminary and final engineering design and construction documents, as well as assistance with bid solicitation, contractor selection, and construction administration. This pathway was designed using the latest standards and best practices set forth by the National Association of City Transportation Officials (NACTO), the American Association of State Highway and Transportation Officials (AASHTO), and the Manual of Uniform Traffic Control Devices (MUTCD). Construction of the three pathway connections was completed in 2015 and 2016. This 40-acre park property is located on the banks of the Snake River near the northwest intersection of Wyoming Highway 22 and 390 – at the junction of Jackson, Wilson, and Teton Village. Harmony Design & Engineering completed roadway plans and grading and erosion control plans for the roads through the park and also collaborated with Pierson Land Works and Hood Design Studio on the master plan for the park, which included passive recreational amenities such as trails, picnic areas, nature and wildlife viewing, gathering areas, a pathway bridge and pathway, and public art in a natural setting. Harmony collaborated with Flitner Strategies and the Rendezvous Lands Conservancy to develop the public involvement plan which included an online survey, two public workshops and a community party. Over 500 community members participated and gave feedback on the park design and program. This project included demolition of the existing street, re-grading the subgrade and reconstruction of the pavement, ribbon curb, drainage pan, adjacent sidewalks and ADA ramps. Drainage improvements included the installation of an infiltration swale to mitigate stormwater runoff. Harmony Design & Engineering provided civil engineering services including roadway design, grading and drainage design, and preparation of construction documents including plan and profiles, cross sections, and grading and drainage plans. 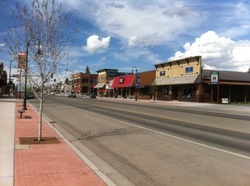 River Street is an underdeveloped business district the Hailey downtown core which currently lacks basic pedestrian facilities. Harmony Design & Engineering assisted the City of Hailey with an Idaho Department of Commerce Community Block Grant application by providing conceptual engineering and landscape plans for the River Street Improvements. Harmony staff facilitated charrette style public workshops, held small meetings with stakeholders, and facilitated a design workshop that focused on the design for River Street. Based on all of this input, the River Street improvement plans were developed with the goals of slowing down traffic, increasing pedestrian and bicycle safety, improving storm drainage, and beautifying the downtown area, all in the hopes to attract business. The workshops resulted in strong community support for the project. Harmony Design & Engineering is currently working with the City of Hailey to update the concept plan for the northern portion of River Street. Take this short survey to give your input! Harmony Design & Engineering completed an evaluation of the existing infrastructure in the core four downtown blocks of the District including water, sewer, stormwater, electric, and telephone utilities. After the evaluation of existing infrastructure was completed, we prepared an evaluation of the future utility needs based on the Downtown Framework Plan. Working in conjunction with another local engineer, Harmony completed a Snow Storage and Stormwater Management Plan that included an evaluation of the existing snow storage facilities, a computer model of the existing stormwater system, and proposed future improvements for these systems. Trail Creek Crossing is a 6-acre mixed-use development designed with a refined, rustic feel. Harmony Design & Engineering completed a hydraulic analysis of Trail Creek, mapped the Trail Creek floodplain, designed a low-impact stormwater system for the site, designed low-water landscape plans, and assisted with the Master Development Plan for the entire neighborhood. Alternative transportation was a priority for the Master Plan and residents of the community will have walking access to commercial businesses in the development and downtown Victor. Trail Creek Crossing is in the construction phase. 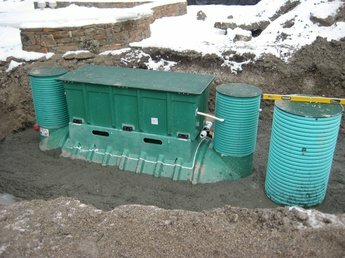 Harmony Design and Engineering has completed engineering design for numerous small wastewater facilities (SWF), or septic systems, located in Teton County, Idaho, and Teton County, Wyoming. Homes being constructed in Teton County, Idaho, that require advanced treatment or an alternative septic systems must be designed by a licensed engineer. All residential SWFs in Teton County, Wyoming, must be designed by a licensed engineer. Harmony can guide you through the regulatory process by gathering data to determine soil types and groundwater levels, conducting percolation tests as required, designing the septic system and leach field, and completing all necessary permit applications and inspections.